Mortars are short distance high trajectory cannon designed for shooting over the walls of fortifications. In the US Civil War armoured barges like the model below were used to get the mortars within range. If you get the taste for paper ship building, this is a good site to visit. There are a few free downloads, and the quality is very good. 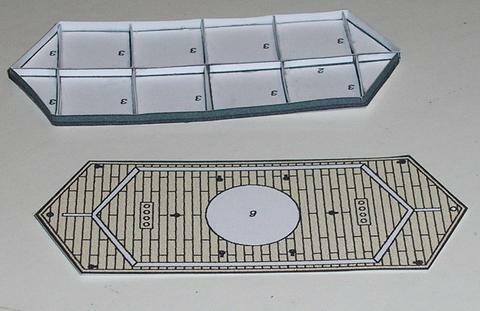 The scale makes them quite small; the mortar barge is only 74mm long! I ended up rolling the trunnions for the mortar barrel around a piece of paper-clip wire, by feel, as I could not really see them all that well. I have since bought a head-band mounted magnifier, which is a great help. Here is a picture of the hull before the deck was glued on, to give you some idea of the internal bulkheads that stiffen it.